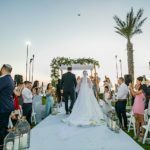 We got married at Olmaya in Jerusalem. Olmaya is located on the Tayelet promenade (overlook point) where you get the most incredible view of the entire City of Gold. 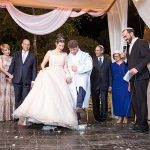 It was very important to both of us to get married in Jerusalem, as that’s where we live currently, and the only place we’ve both lived since making Aliyah (Jordana moved 7.5 years ago and Uri came to do the army and make Aliyah 11 years ago). 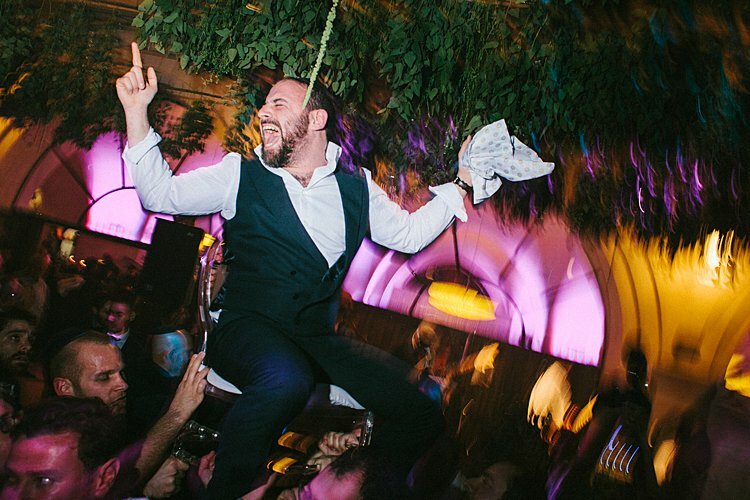 It was definitely a risk planning a wedding in Jerusalem in the winter because the weather can be so unreliable but thank G-d we were blessed with the most sunny winter day. 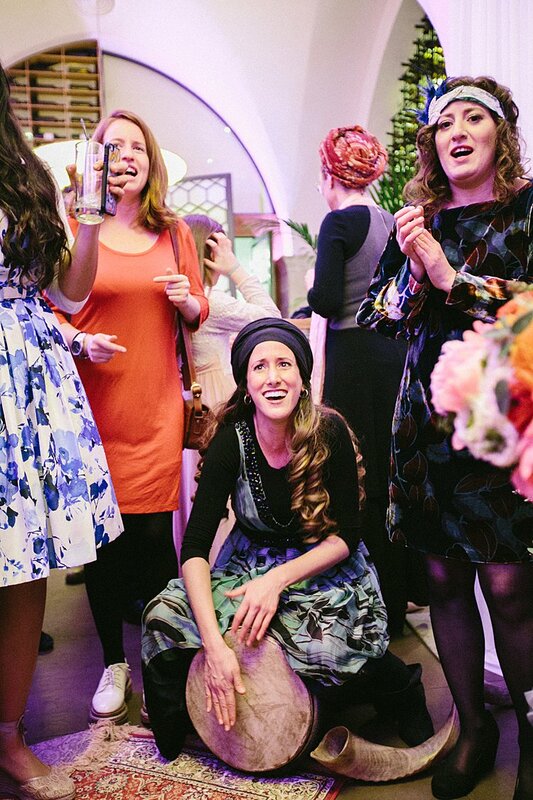 I had always imagined having a really out of the box wedding, I guess neither of us have ever been quite traditional. 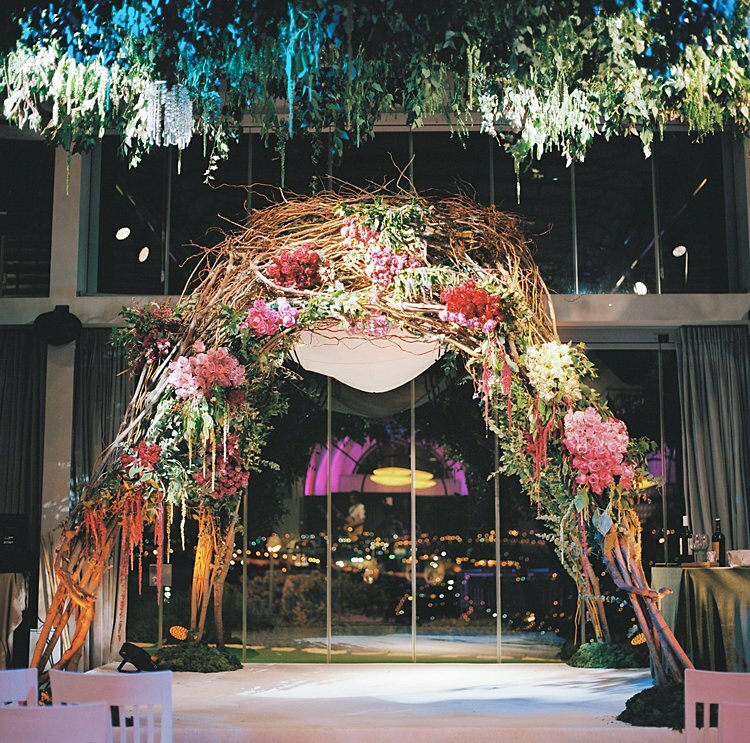 Because my mom is such an incredible and innovative event planner (Penny & Co. Events) I grew up constantly surrounded by unique decor for weddings and events. 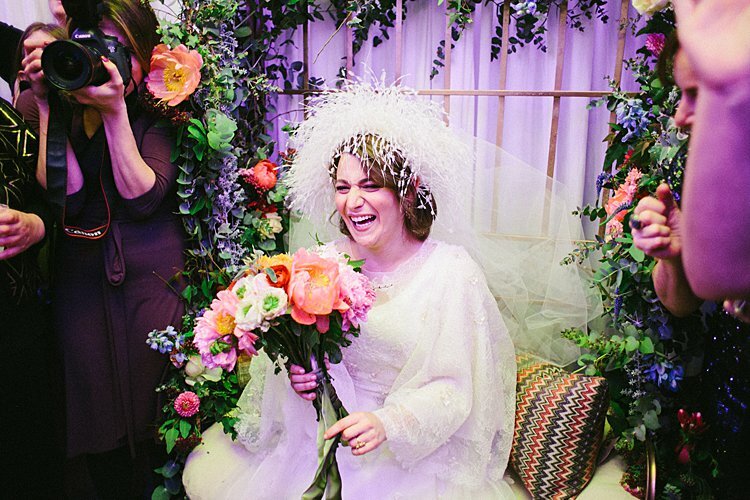 Because our wedding was in the winter and entirely indoors it was really important that the space be transformed to what would feel like an authentic enchanted garden. 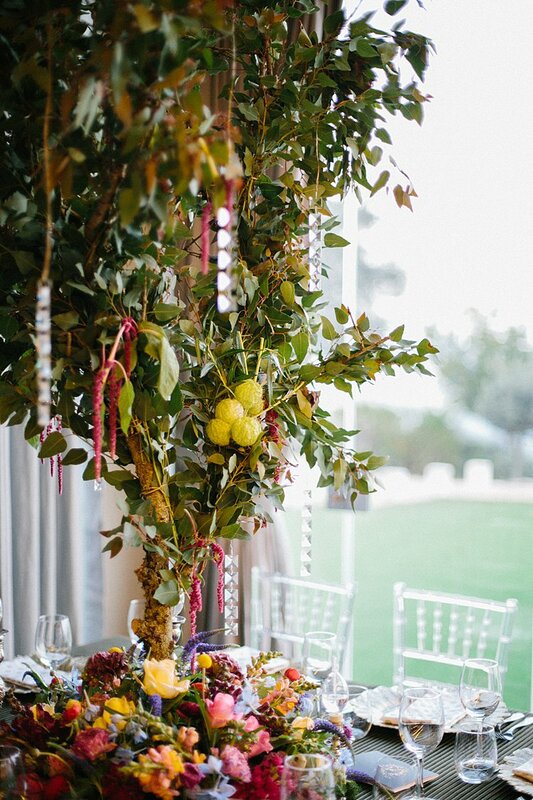 My mom (Penny) really worked her magic for our wedding with everything from the perfect shades of color for the lighting, to the hanging greenery and chandeliers, to the mix n’match napkins on each place setting and custom green velvet table cloths. 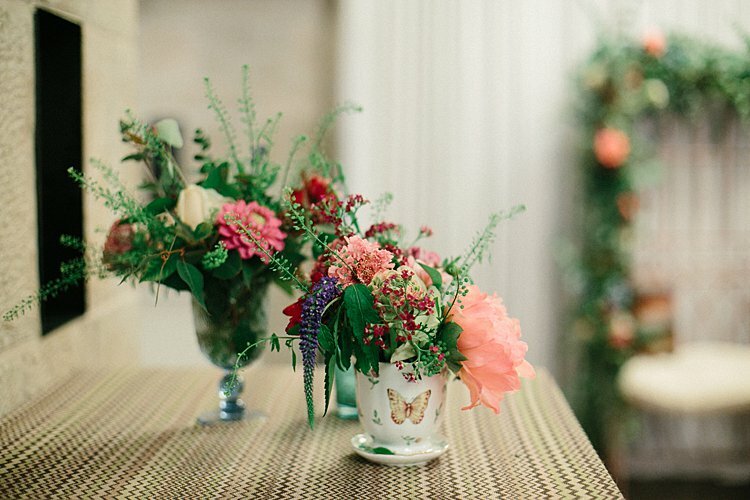 We had two different styles of table at the wedding. 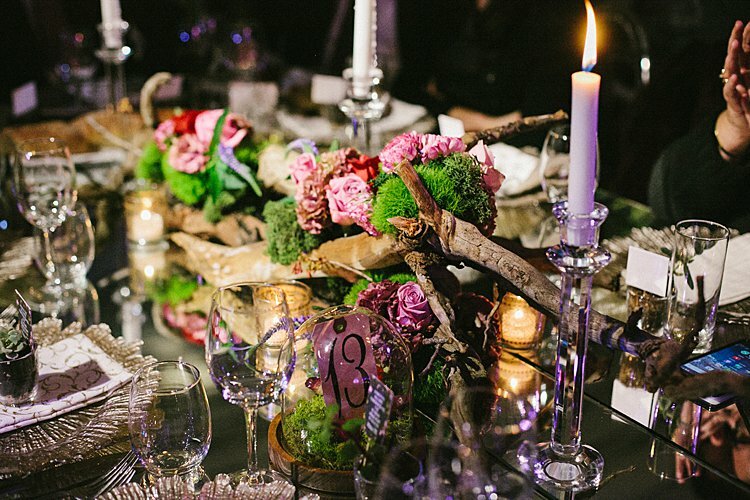 Directly around the dance floor were mirrored knights tables with earthy, fanciful centerpieces, and the other tables were graced with the most gorgeous trees dazzled with hanging crystals and blooming with different flowers at the base. Honestly, some friends asked if the trees were growing out of the tables. 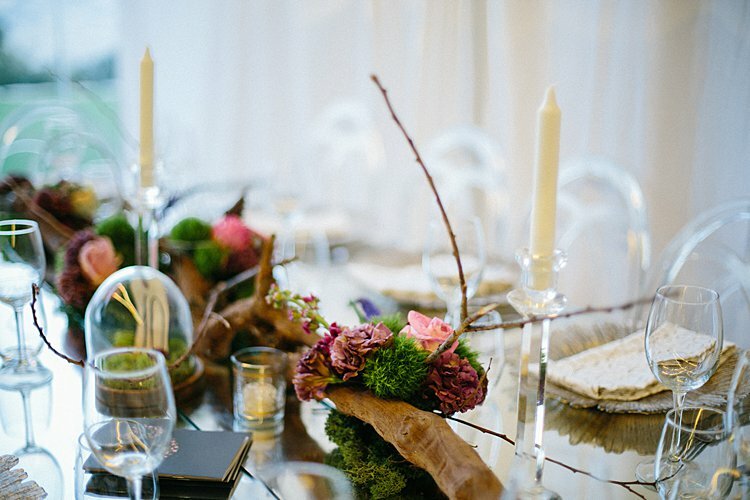 Our florist Sara Winter Floral Artistry is a very close friend of mine and she really transformed my mom’s vision and design into a dreamlike reality (she literally foraged each tree for each centerpiece). 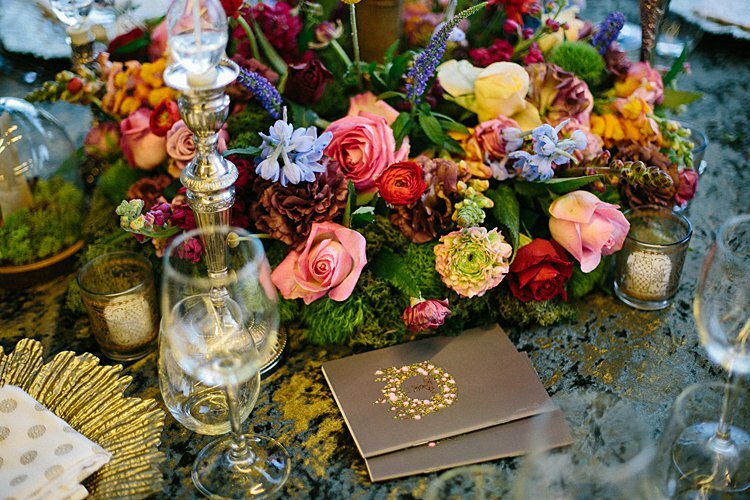 As for the overall color scheme of our wedding, my only request was that it be colorful and not traditional. 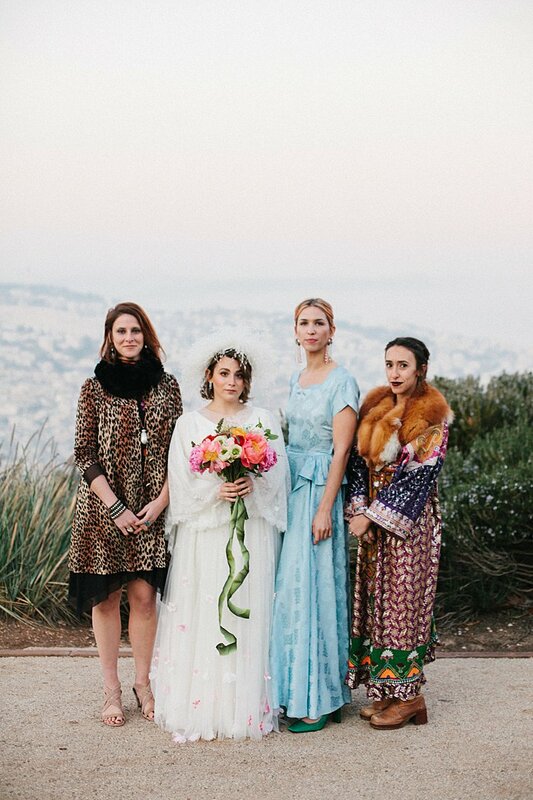 I knew my close friends would all wear such unique pieces to our wedding which definitely added to the distinctive look of our wedding. 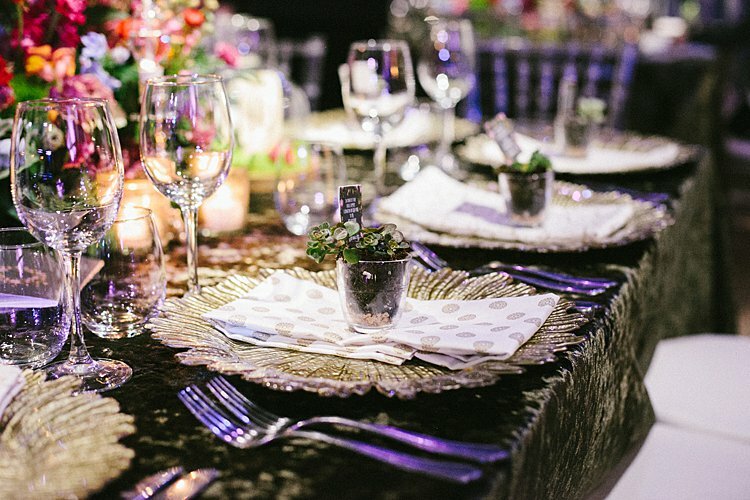 For the reception I wanted to use these sparkly Missoni-esque tableclothes my mom had and took inspiration from one of my style icons Margherita Missoni’s mismatched wedding. 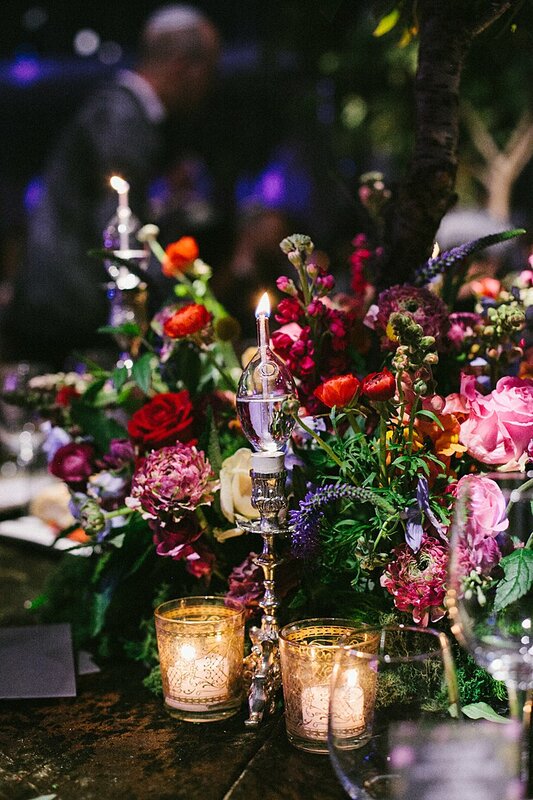 The flower arrangements on the cocktail tables were all mix n’ match glasses and vases blooming with large flowers. 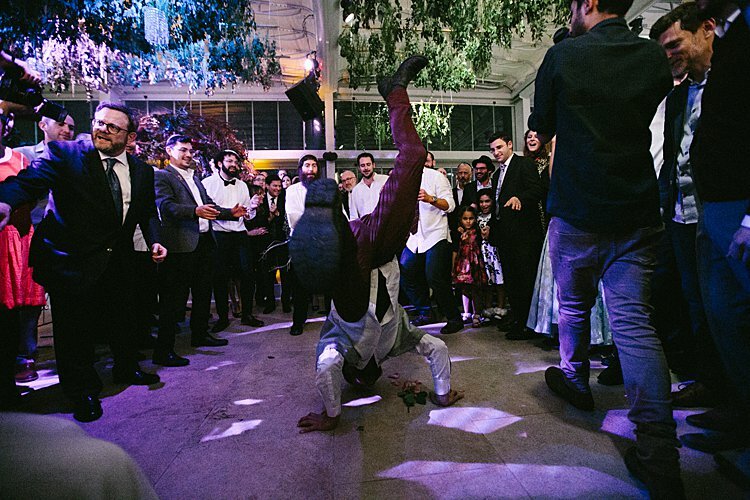 We had a few custom colorful pillows made (which now adorn our apartment) and some persian rugs dispersed around the reception hall to give the room a more bohemian vibe. 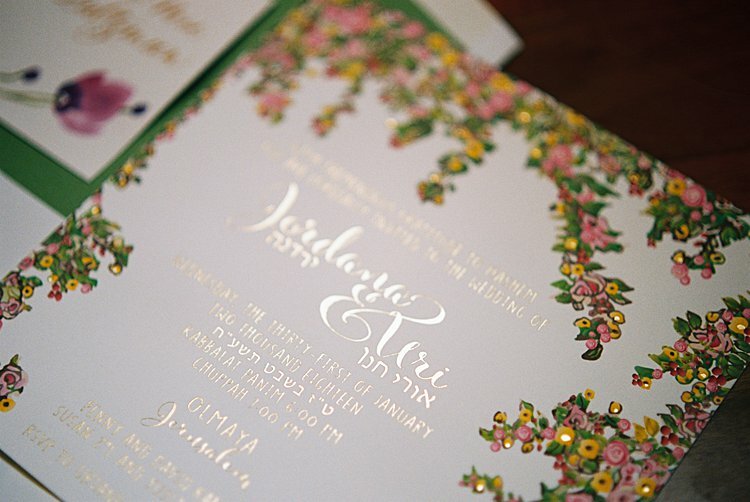 My mom hand drew the florals for our invitation and then turned that design into a whimsical colorful invitation. It was really important for us that each element be unique. We used the same florals for the design on our benchers and I can honestly say every time we use them (or our friends use them) we comment on how absolutely beautiful they are. 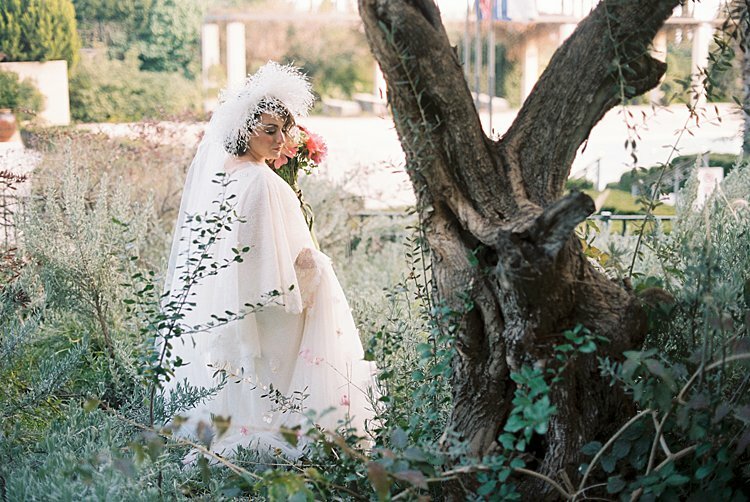 I am forever grateful for Leah Neppe for her true talent and expertise she gave me on our wedding day. 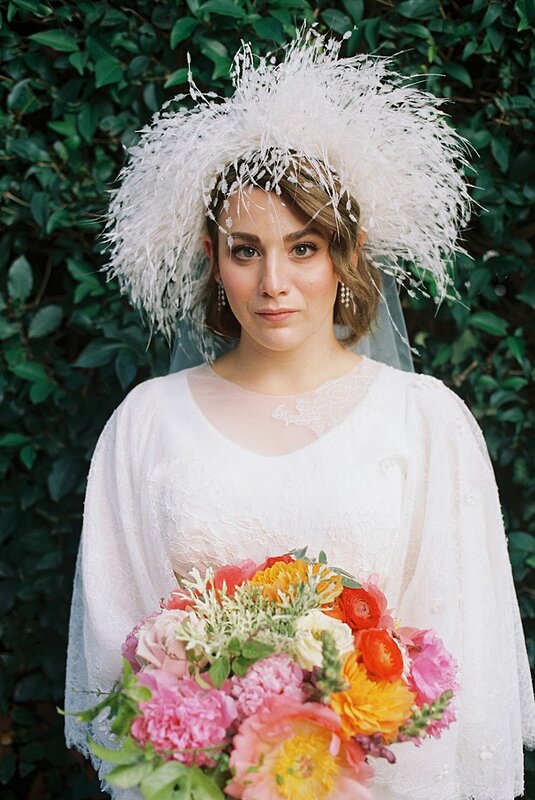 I know a lot of brides say this, but I really just wanted to look and feel like myself on my wedding day, of course a bit more glammed up than usual. I showed Leah one photo of a dewy, natural makeup look that I found on pinterest and I can confidently say she made me up to be even more whimsical than the model pictured. 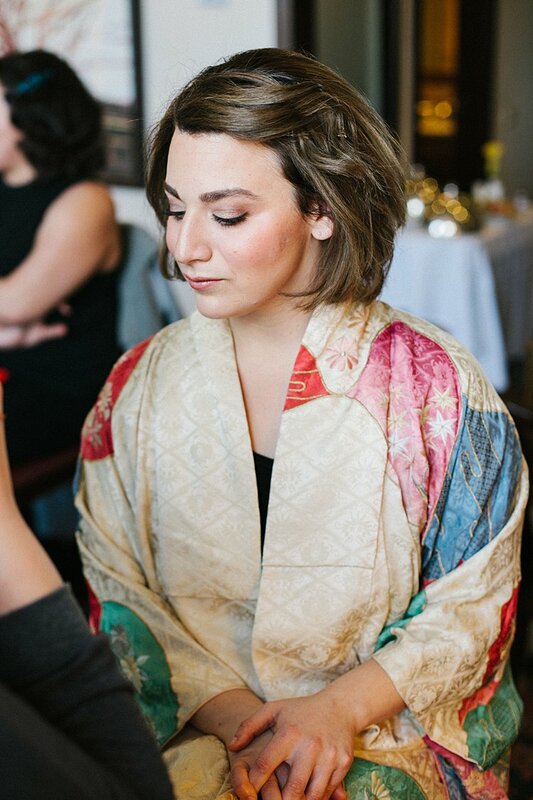 I have had a curly bob for some years now and I really wasn’t interested in having extensions for our wedding. 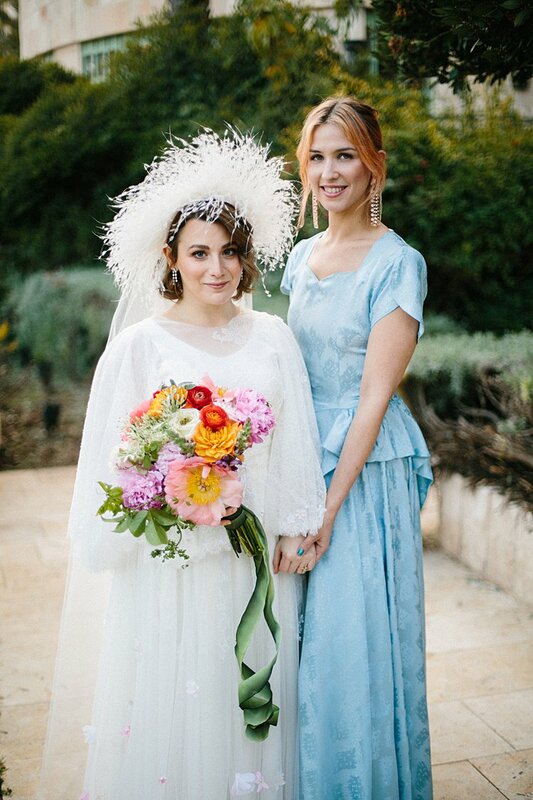 While my hair style was quite simply pulled half back, Leah gave me the most dainty, old Hollywood glam side bang in the front, which so perfectly complimented the feather headpiece. As fashion is one of my greatest loves the dress was really an important aspect for me. Wow, the dress. How can I describe this story other than a complete miracle of love. 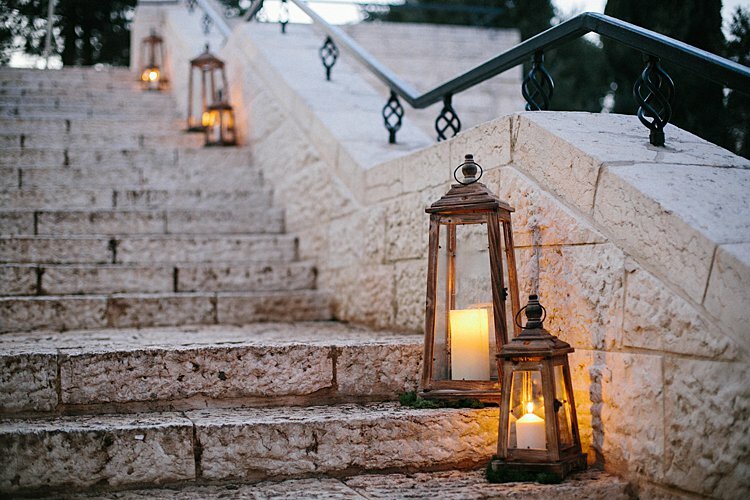 Uri and I knew we’d be traveling to the States shortly after getting engaged so I reached out to Samantha Sleeper, a designer whose work I so admired on Instagram. Within days Samantha and I facetimed, she drew a sketch and I knew that she’d have to be the one to make my wedding gown. On our first day in NYC I went to Samantha’s studio and it was a no brainer. Samantha took my inspiration and created a truly couture gown. It was also the first time Samantha had the restrictions of making a modest dress and she completely nailed it. 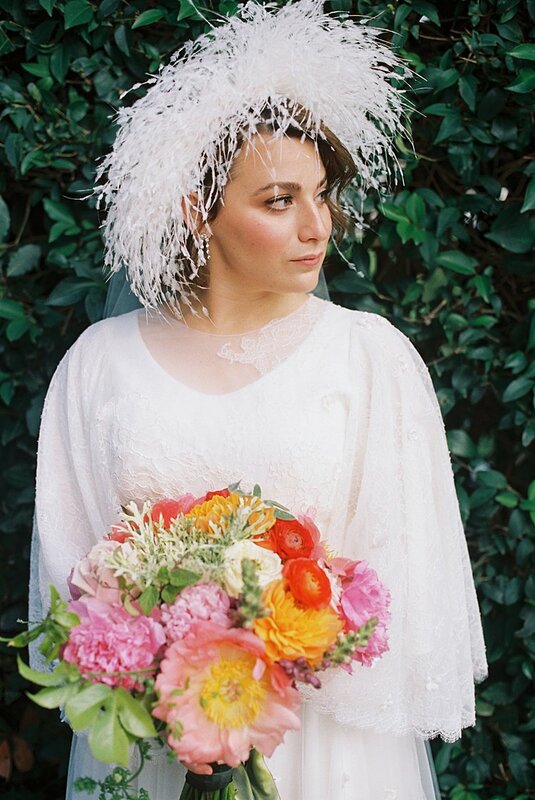 I didn’t want to shy away from any of the unconventional details like pops of color and texture. We decided it would be fun if the dress was two pieces, a simple slip dress and an intricately detailed overlay dress. 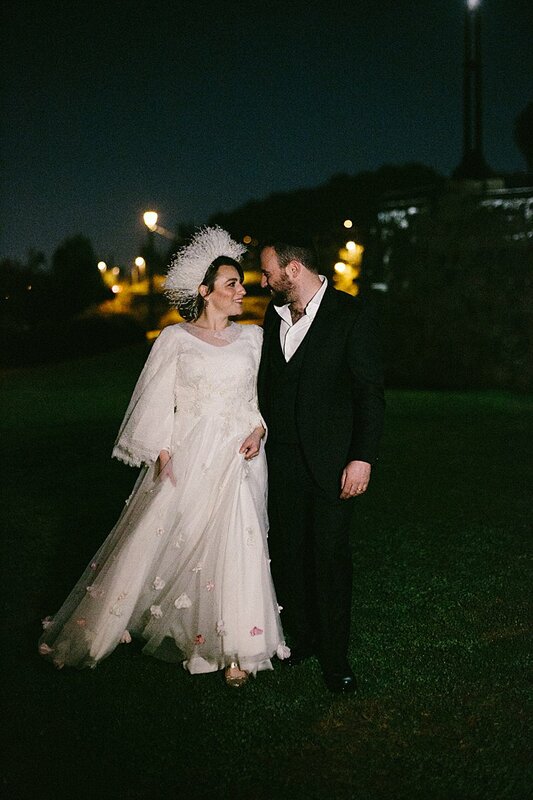 My dress took inspiration from some of my favorites, Valentino and Rodarte, but was still entirely something fresh. Samantha decided to turn the wing sleeves into a capelet back which just felt so ethereal. Upon our next meeting one week later, which would be my first and only fitting, Samantha had made the detailed base of my dress. My fitting for the wedding dress was a real dress up and have fun moment with my mom and Samantha. Samantha handed me the couture feathery headband she had made for a photo shoot and it instantly took my look to what felt like a high fashion winter bride. Samantha was so insistent that I need to wear this party piece that she gifted it to me! I look forward to the occasion I can wear it to next. As for jewelry, because of the intricate details on my dress and headpiece I opted to wear my engagement ring and earrings lent to me by my mother. Once I received the dress a week before the wedding, I looked through my mom’s jewelery box and found the sweetest pair of dangly white gold and diamond earrings. To me they looked like fairy dust and complimented the entire look. 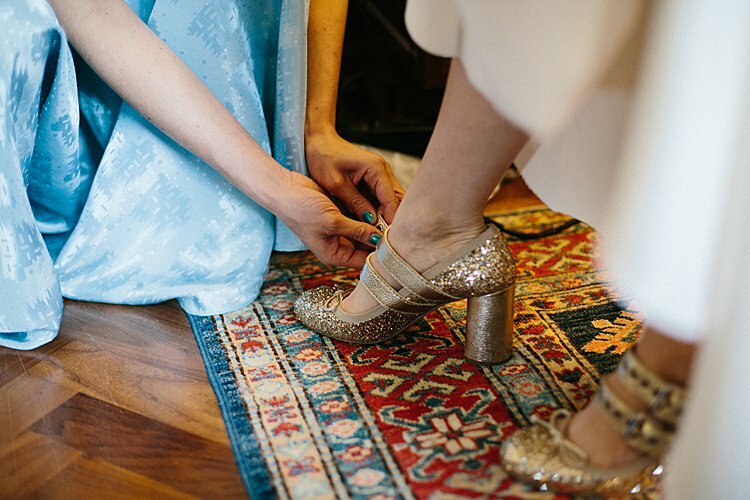 I always said I was going to wear a pair of sparkly Miu Miu shoes to my wedding, mostly because it would be an excuse to own a pair for the future. Luckily, I was able to find the perfect pair on the second hand designer website, TheRealReal. 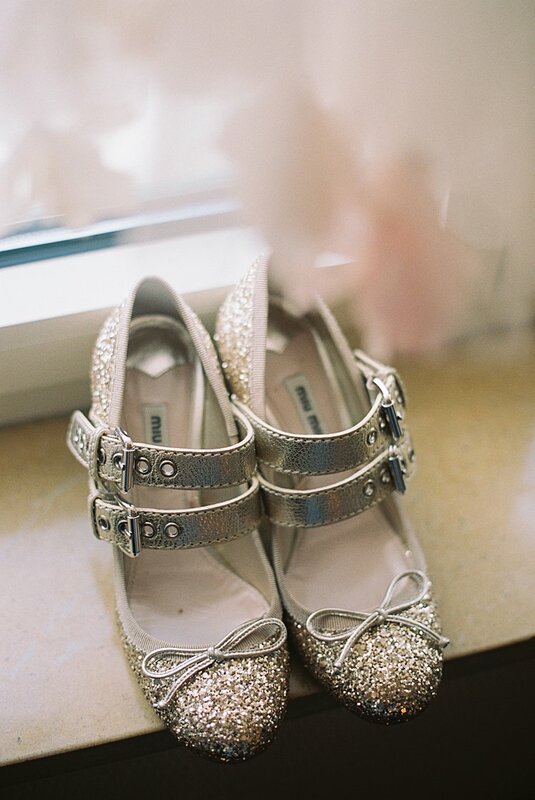 As soon as I had my first meeting with Samantha Sleeper (even before having a fitting), I went right online and found the perfect pair of gold sparkly Mary Jane style heels with double punk inspired straps in exactly my size and in perfect, like new, condition! Whilst in NYC Uri went shopping with his best friend Dov, who has impeccable fashion sense. The two decided on three piece navy blue suit from Massimo Dutti, and a crisp white slim fit shirt from the Japanese brand, Maker’s Shirt, and classic navy blue tie from Massimo Dutti. As a surprise, my younger brother Josh bought Missoni socks for the groom, my dad and brother. Even more exciting was the giant peony boutonniere Sara Winter made, knowing that I love peonies, and the more ridiculous the size better. I didn’t have any official bridesmaids. I have two older sisters and we decided it would be fun if we all were wearing some fun headpieces, so three days before the wedding, I made them twenties inspires headdresses to wear with their (coincidentally) coordinating velvet dresses. 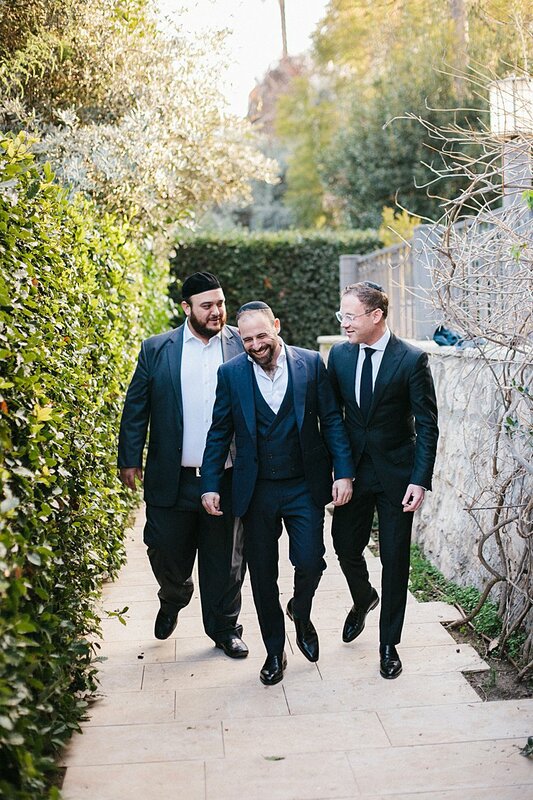 My three closest friends (two from NYC and one in Israel) were really there for me in the days leading up to the big day and it was very important for me to honor them as well. In particular, I couldn’t have stayed as calm as I was without my best friend Sarah, who literally massaged my hands while I got my makeup and hair done. As for their ensemblese, I fully trusted all of their creative ability in putting something fun and colorful together, which also felt uniquely them. 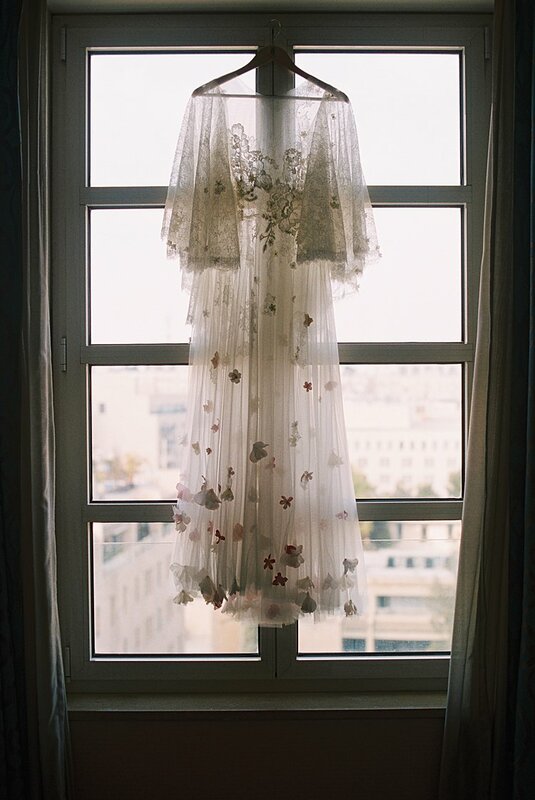 My friend Rami bought her dress on her travels in India 3 years prior to my wedding, with the intention of wearing it to my wedding one day. Good thing we got married in the winter because it would’ve been very heavy for the summer. 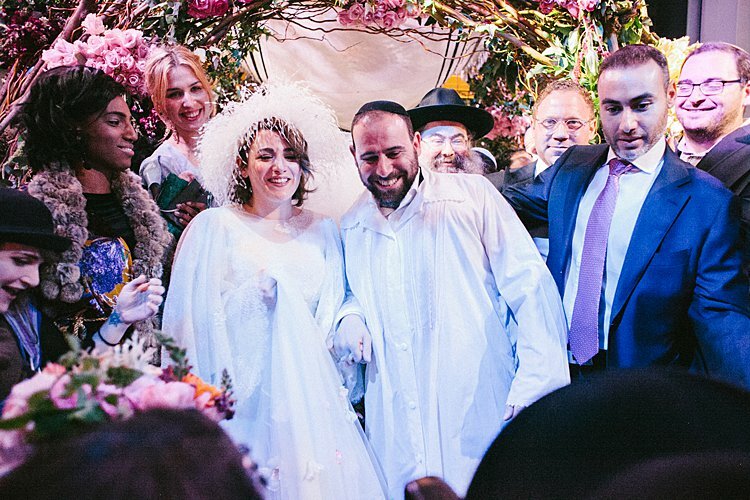 The chuppah design was all my mom. 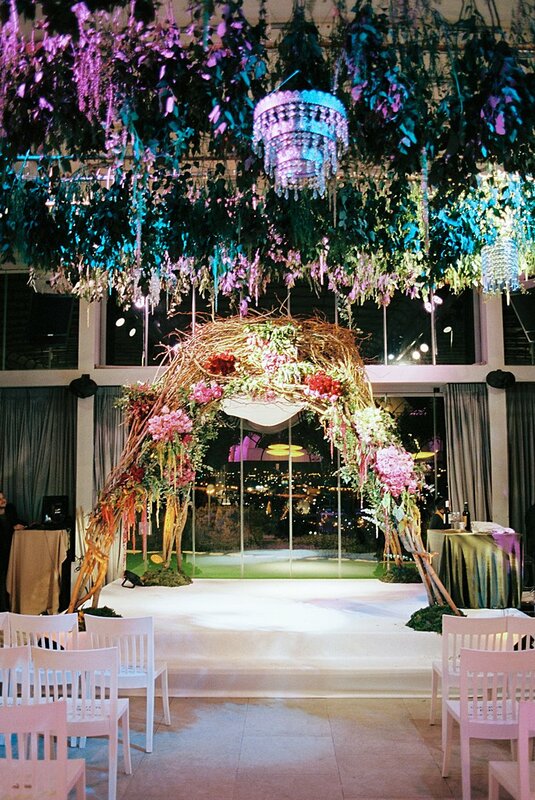 It was her idea to build an enchanted structure to add to the overall design of the room. 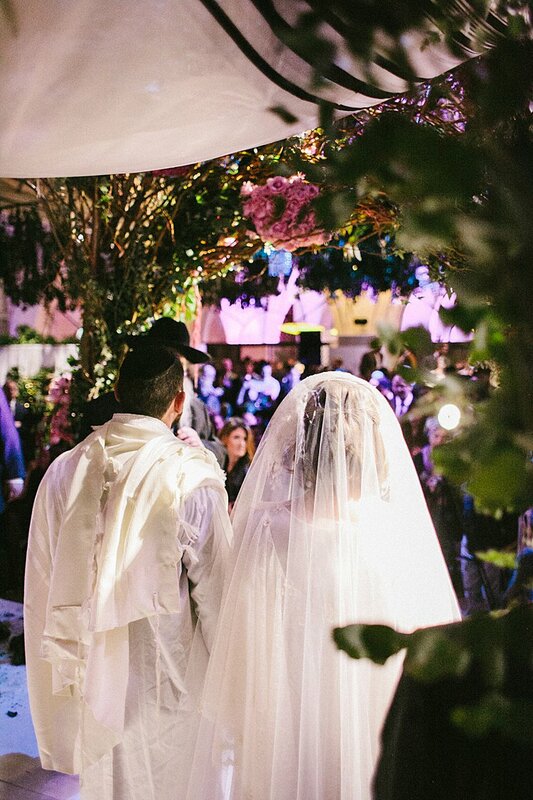 For the dinner, Uri and I were seated under the chuppah. 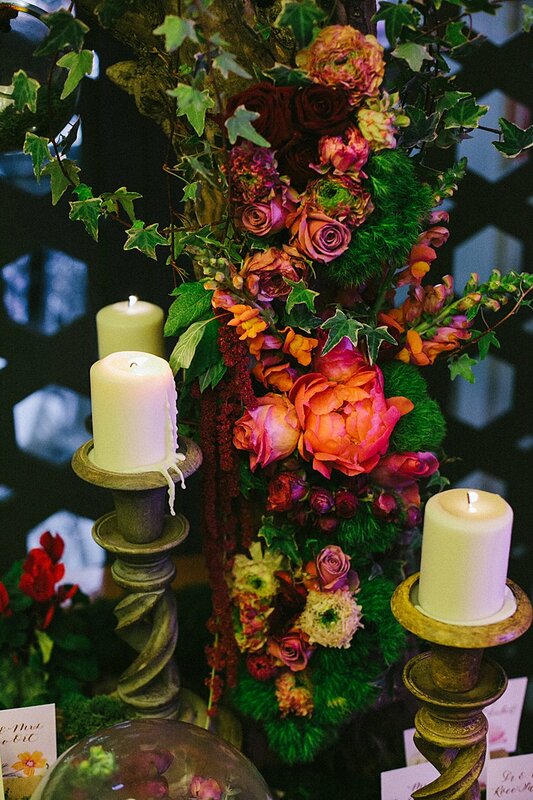 The structure was incredibly special and intricate and I absolutely loved the natural effect of the rose clusters. 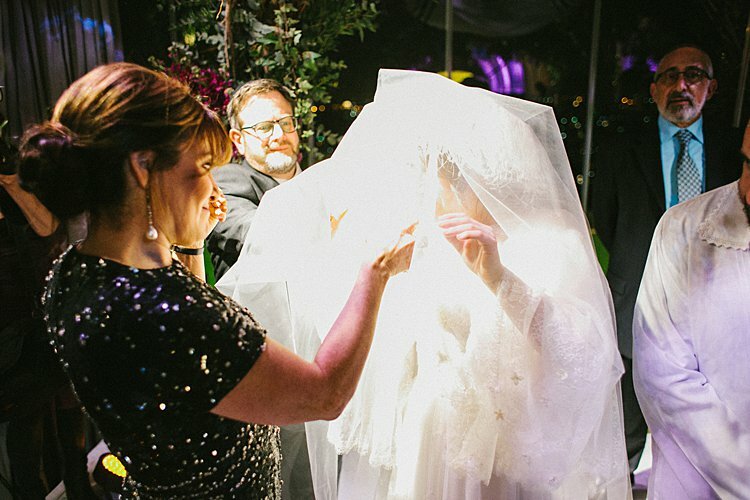 Planning our ceremony was an emotional labor of love. My husband Uri lost both of his parents (his father when he was 18 and his mother 4 years ago). I never had the opportunity to meet them but it was very important for us to honor them on our big day. My sister Nina wrote up lovely notes, placed on each chair, to have Uri’s parents in mind during our chuppah ceremony. 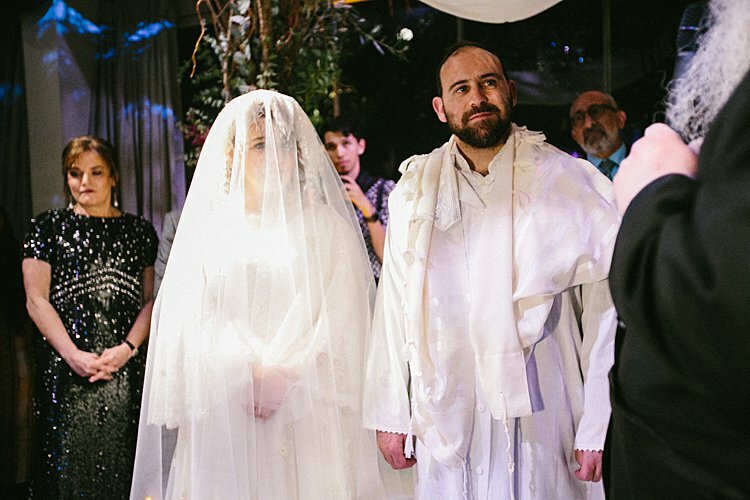 Leading up to the chuppah we had a very special badeken ceremony led by Rav Shlomo Katz with words of Torah and singing before Uri veiled me. Uri and I hadn’t seen each other or spoken on the phone for the week leading up to our wedding (including pictures beforehand) so this was a very exciting moment for us. 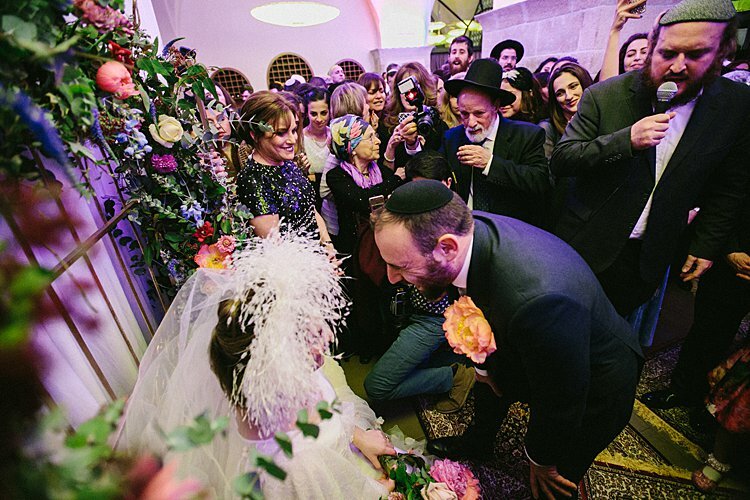 We were so humbled that Uri’s childhood Rabbi came in from London to marry us. 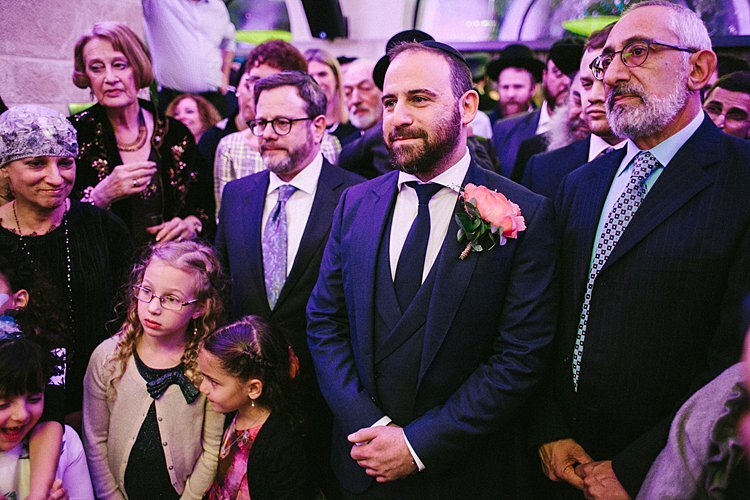 It was such a an honor to have him under our chuppah as he knew Uri’s parents well. Our ketubah is an absolute piece of art. My dear friend Aviva Curran painted a night time enchanted forest scene in water color and in place of the moon our close friend and very talented scribe Kalman Delmoor wrote the words of our ketubah on a piece of parchment. 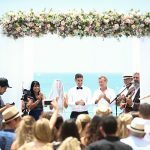 We had an incredible band for our wedding. 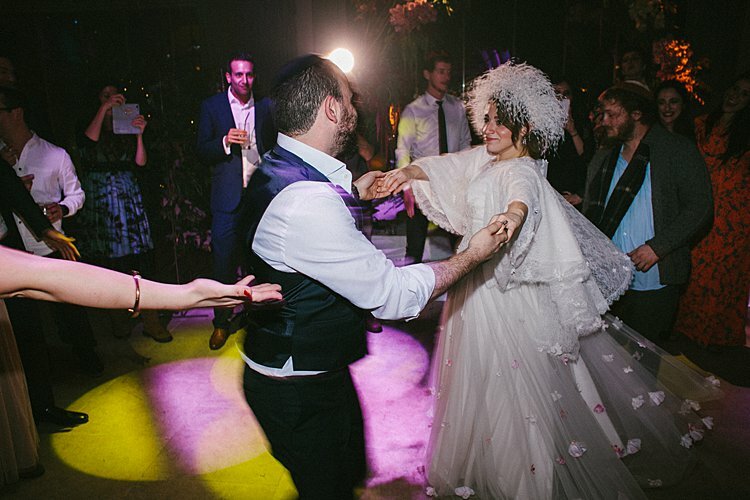 They started the dancing with lively Jewish music with funky instrumentals. After dinner and sheva brachot we switched to funk and rock n’roll classics. And finally, we ended the night off with our dear friend Avi Friedman DJing all our favorite dance beats. 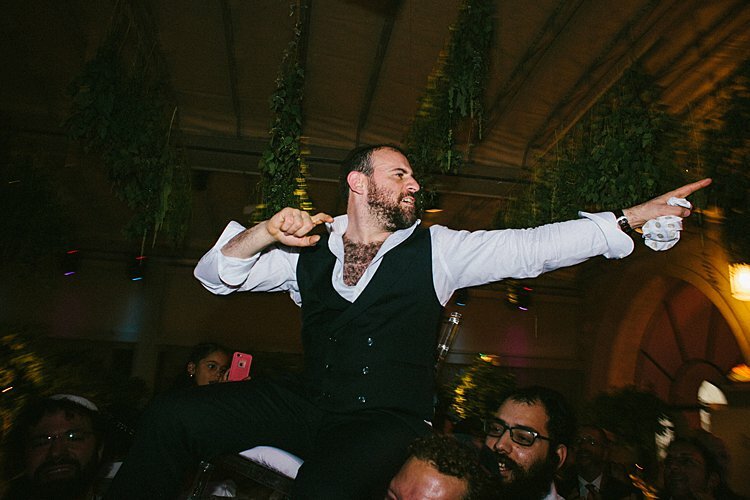 I would like to note that Avi worked for the florist with set up and break down, and was a guest at our wedding, where he danced himself silly and DJed at the end of the night. 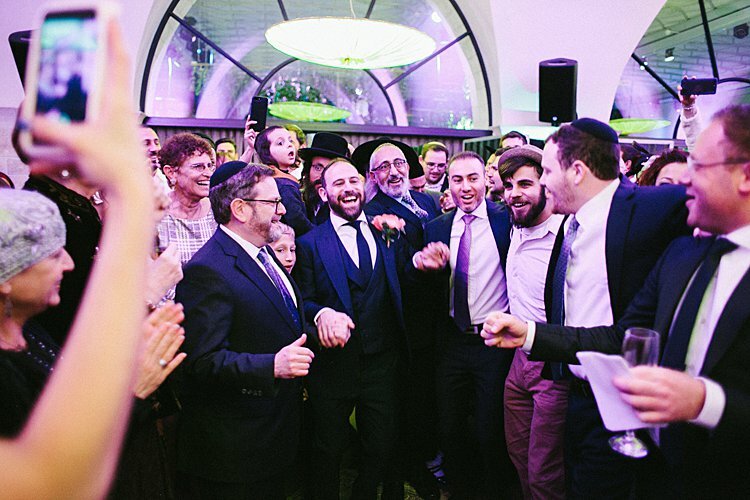 We had real miracle workers behind our special day, and we’re eternally grateful to them all. For my bouquet my one request was that the flowers be big and blooming! 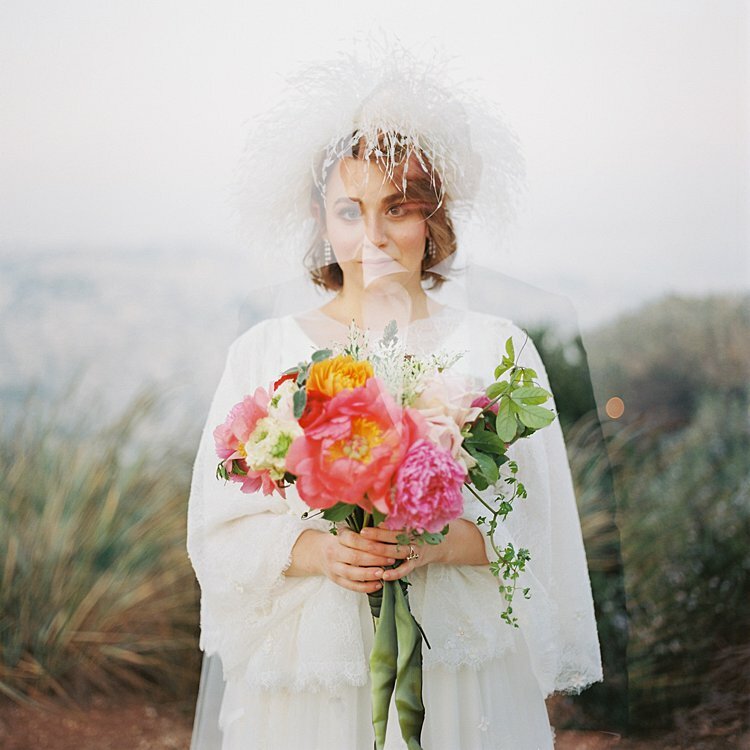 I was so lucky that my favorite flowers, peonies, were in season at the time of our wedding (this isn’t usually the case in Israel in the winter). Sara Winter did a gorgeous job at putting together the most gorgeous, unique bouquet, Uri described the bouquet as looking like a carnival. 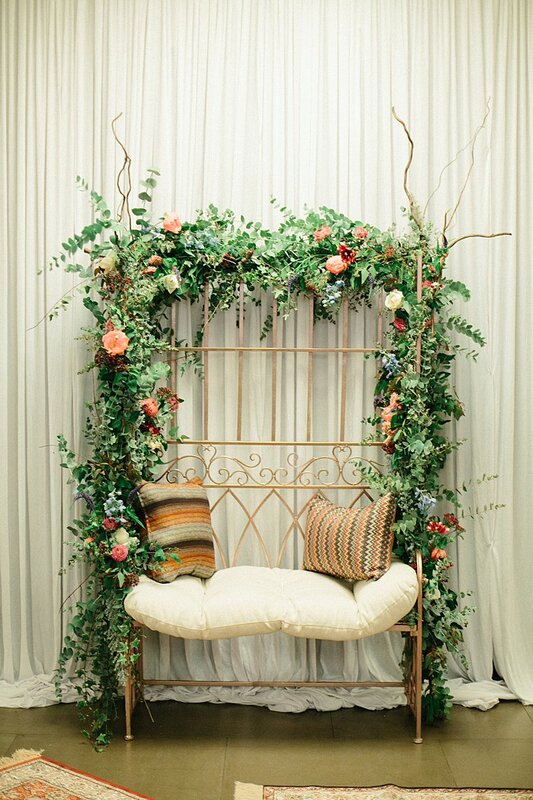 I didn’t have a specific vision for my bridal chair during the reception, but I knew (like the other florals) that I wanted a messy, wild, natural look. My mom knew exactly what to do and designed something more perfect than I could’ve dreamed of. And after the ceremony it served as a fun back drop to friends and family’s pictures. 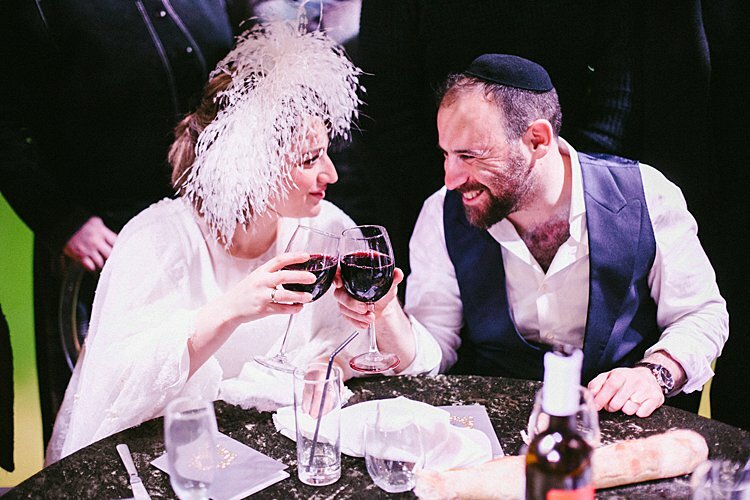 We hired Sigala Photography as our wedding photographers, what we loved most about their work is their ability to take romantic candid photos. We also love their usage of film and black and white. Yehoshua and Rebecca Sigala are also just such a pleasure to be around. 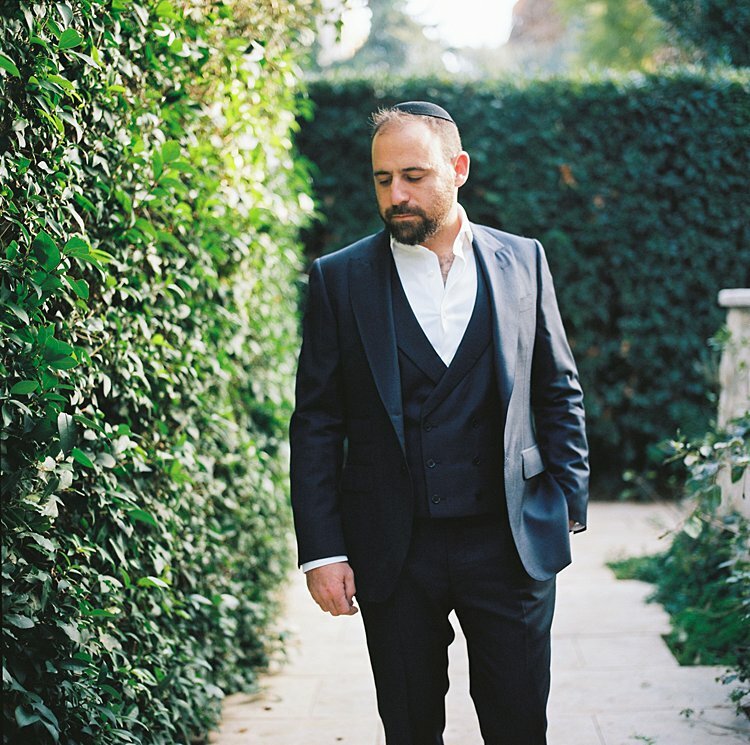 For our videographer we hired Reouven Ben Haim. 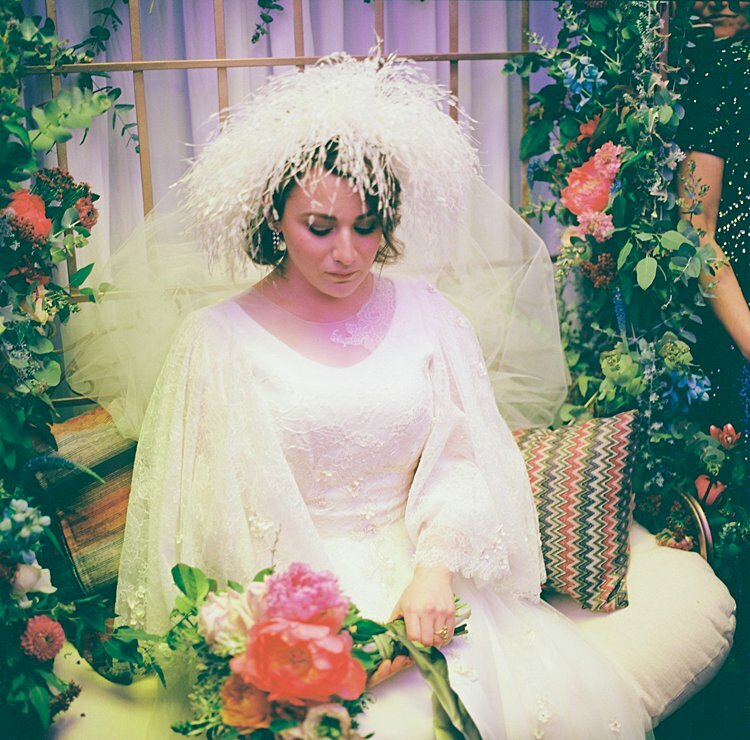 Reuoven himself is an incredible wedding/event photographer (Reouven Photography) as well, but when we saw the work he did for our friends wedding video, we knew that he ws the guy for us. Reouven is such a humble and sweet talent and we love the clip he created for us! As Uri is very much into food (who isn’t) this was an important aspect to the night. We got very lucky in that Tiltan, which is the exclusive caterer at Olmaya, has incredible food! It was so hard to choose at our tasting because everything was so flavorful, interesting and beautifully plated. 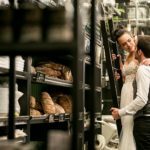 Before our wedding I was worried that with the abundance of food served at our wedding there would inevitably be a lot which goes to waste. I was very pleased to hear that there was absolutely nothing leftover from our wedding! Our friends still talk about the food from our wedding one year later. As parties is my mom’s profession our guests weren’t going to leave empty handed. Firstly, during the dinner we had a vintage inspired black and white photobooth set up. On each place setting was a mini succulent for each guest to take home. These succulents were not only a fun keepsake but were planted by youth at risk who attend a special gardening program at Beit Hatzayar in Jerusalem. 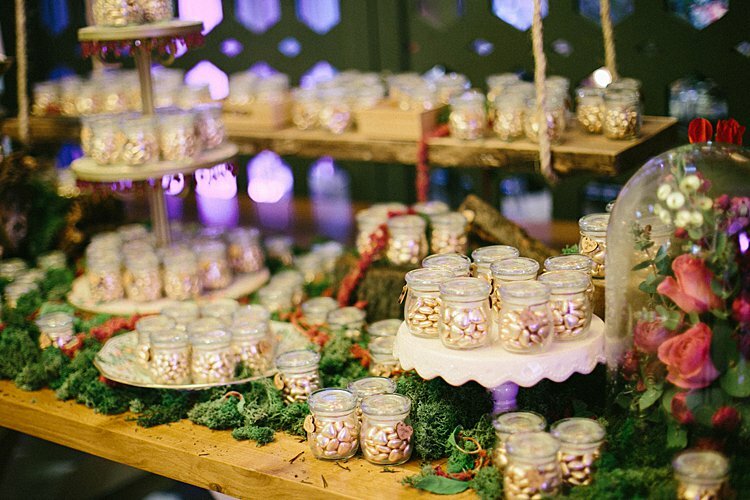 And lastly, at the end of the evening, the card table was transformed into the most whimsical candy display. 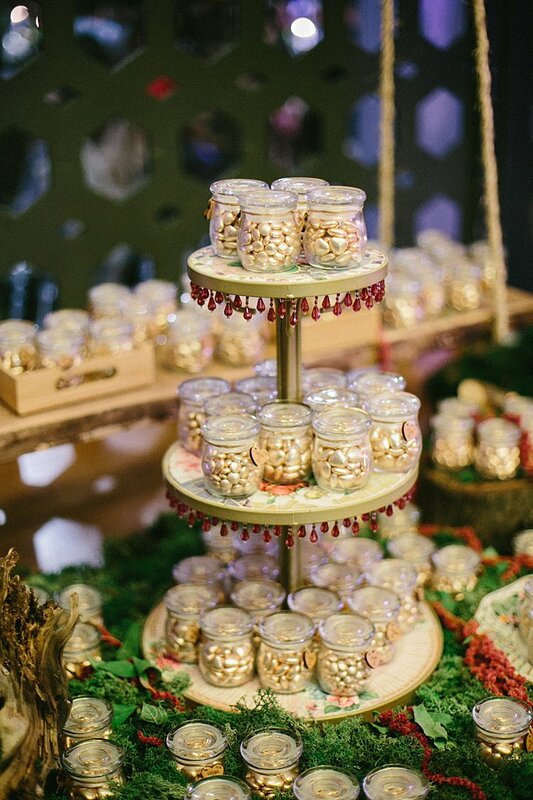 Each guest took home a tiny (I love mini things) glass jar filled with gold heart chocolates. 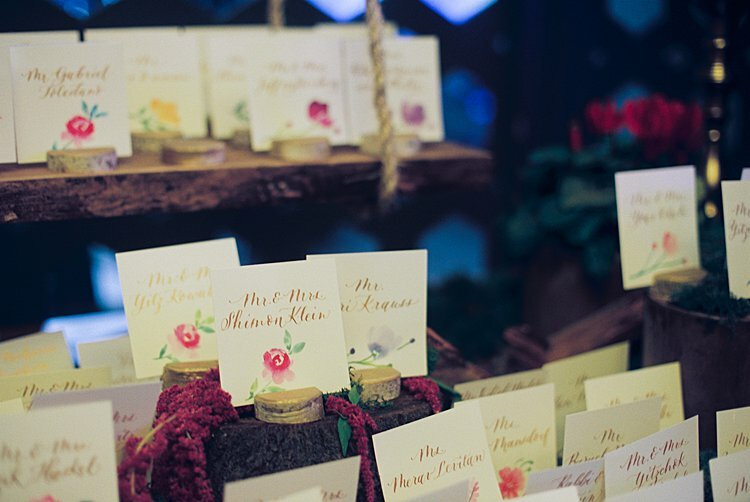 Each jar was enclosed with a small wooden heart with our names engraved on it (like on a tree). The chocolates were so beautiful some guests didn’t realize they were edible! I was very surprised when Uri got up and gave a speech just before Sheva Brachot. I hadn’t anticipated any speeches. 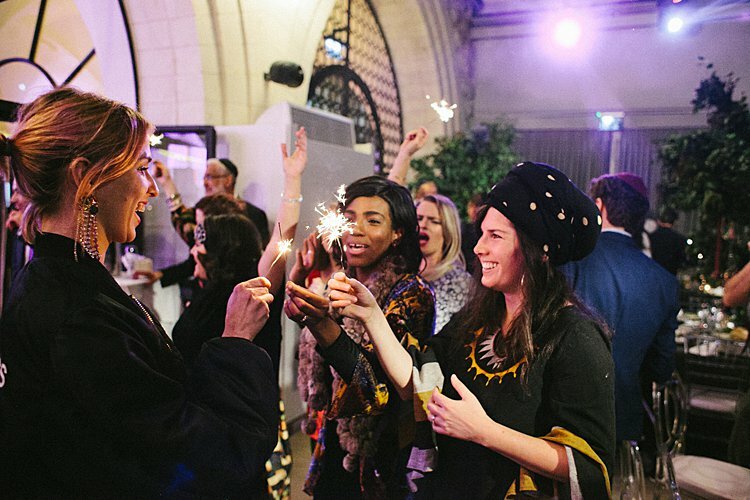 I think what really defined our wedding day was the amount of love and support went into our event. 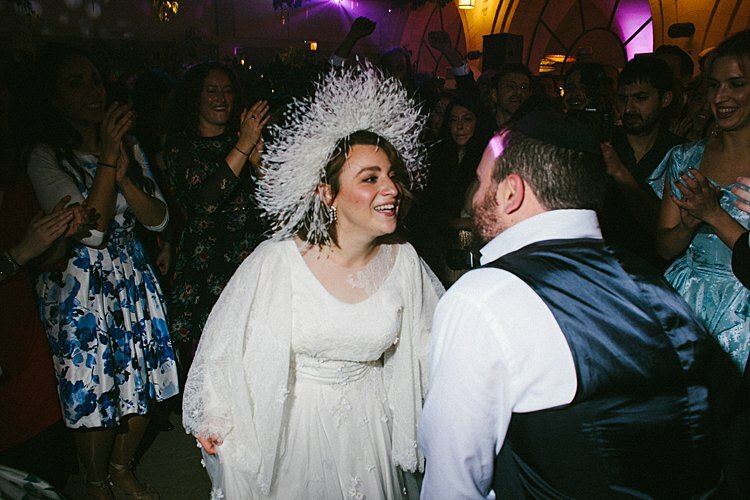 Since Uri and I share a lot of mutual friends it was a real celebration for our close community and we could really feel the joy that was felt by all. I think often times weddings can feel overly planned but we really had the best of both worlds: the outstanding decor and design planned by my mom and the laid back ease of a party. For our honeymoon this past June, we road tripped around Croatia. One place we’d highly recommend is Zrinka House, the sweetest bed and breakfast just five minutes away with the breathtaking Plitvice Lakes. Croatia is like nowhere we’d traveled before. It was the perfect honeymoon adventure! 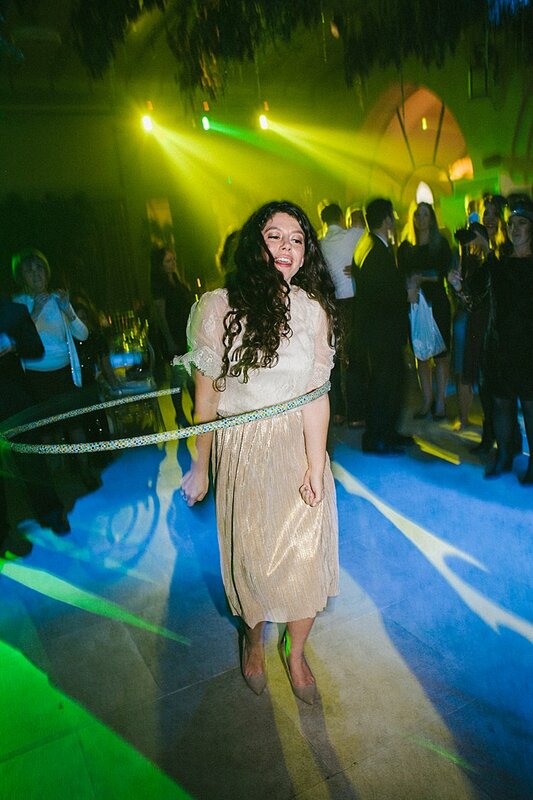 It sounds cliche but my biggest piece of advice for brides is to have fun and be present on your wedding day. 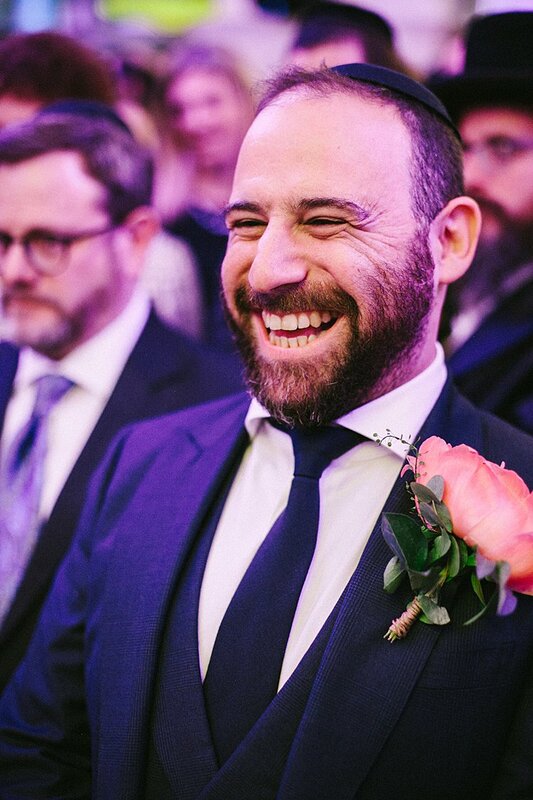 I can honestly look back at our wedding and I remember all the details of the day because I chose to just enjoy and be a guest so to speak at my wedding. I think it’s really great to communicate your vision and flow of the night with your husband to be and makes sure you’re on the same page about everything. 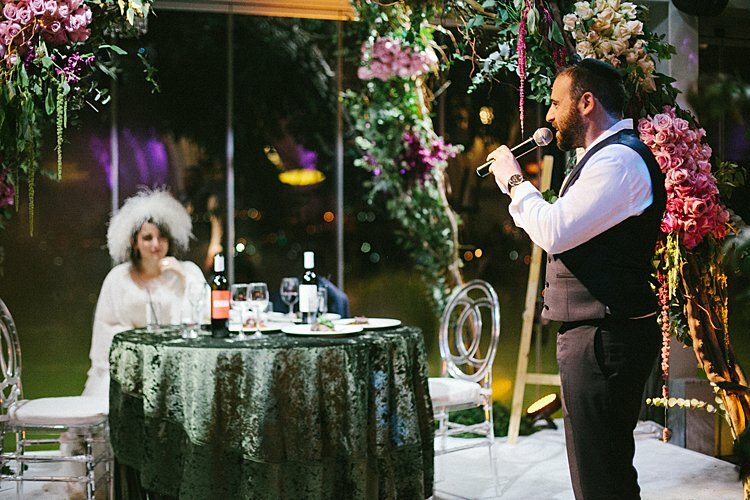 I also, was fortunate enough to actually eat at our wedding (the reception and dinner). I can’t tell you how many couples don’t get to eat the food at their own wedding, so designate a close friend or family member whose job it is to bring you food or make sure you’re eating and enjoying throughout the night. It’s important to make your guests feel loved and appreciated but don’t do anything that doesn’t feel comfortable to you. 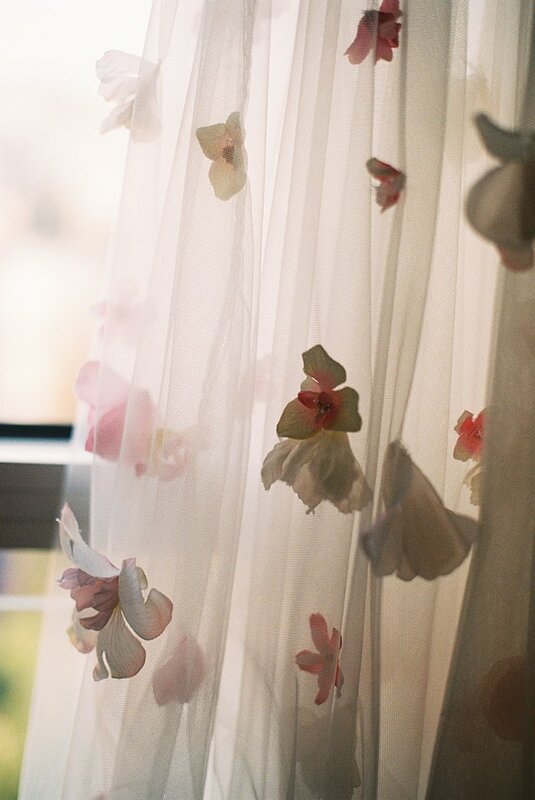 A close friend told me that your wedding is like a marathon so prepare ahead of time like you’re running the marathon.